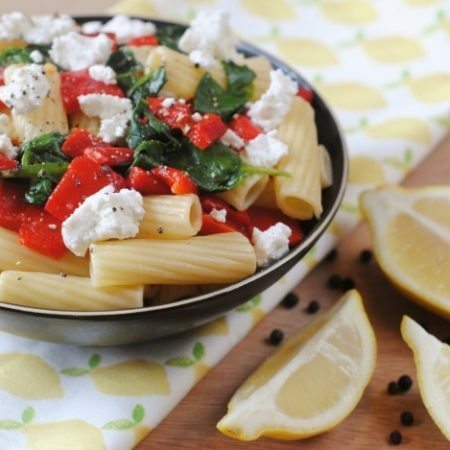 Pasta doesn’t have to come covered in a sauce for it to be enjoyable, and I have kept this Roasted Red Pepper, Spinach and Goats Cheese Pasta dish quick and simple so all the ingredients can shine through. It’s been 10 days since I posted a pasta recipe, can you believe it? I think we need something lighthearted in our lives today, as it is a very emotional day for everyone here in the UK (no matter how you voted), as we have voted to leave the EU. We don’t know how things are going to go now, but we can always rely on pasta can’t we? Hopefully! No matter what is going on in life, pasta is always comforting. Carby, filling and ready in under 15 minutes so you don’t have to resort to ordering a greasy pizza to make yourself feel better. Pasta gets such a bad reputation as being an unhealthy meal, but I don’t believe that at all. Everything in moderation, including moderation itself and as long as you keep the creamy sauces and cheese to a minimum, then you are fine. One type of food doesn’t define how healthy or unhealthy you are. So, that’s why you see pasta recipes on this blog. The Italians are some of the healthiest people in the world after all. 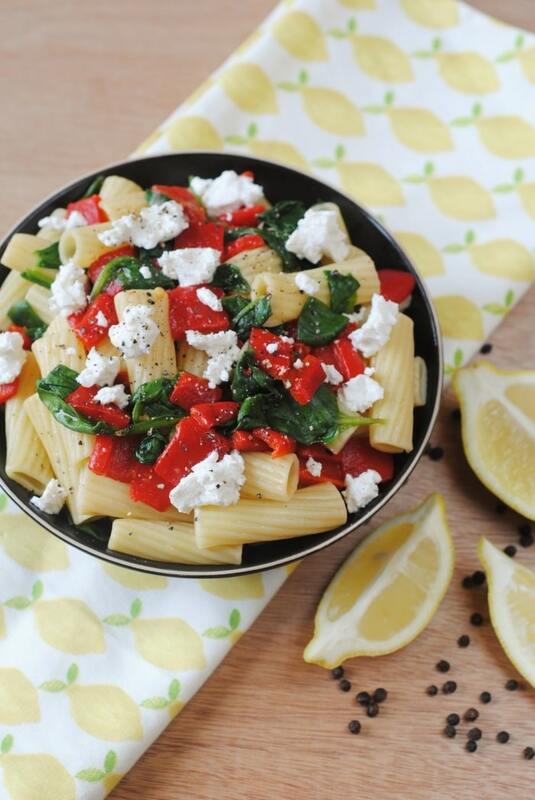 To keep our pasta dishes healthy we focus on adding ingredients with strong flavours, but that don’t have a lot of extra calories, which is why we usually add some Peppadew Roasted Red Peppers. Although we would usually blend them up in to a pasta sauce, seeing as this doesn’t really have a sauce to speak of, we just chopped them up and mixed everything in – it gives the dish a nice pop of colour too. Grown until perfectly firm and plump Peppadew then carefully pick and de-seed the peppers before hand cutting them into whole generous portions. 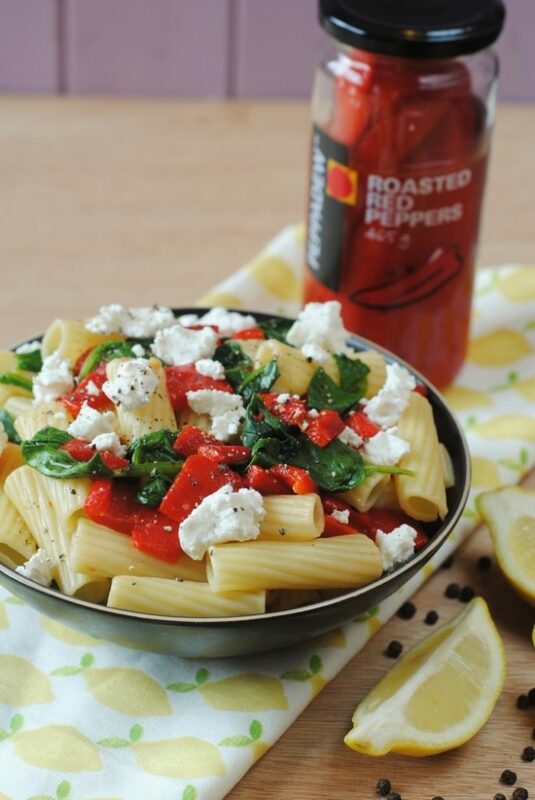 They are flame roasted as this retains their natural taste and colour and gives you the best roasted red peppers. 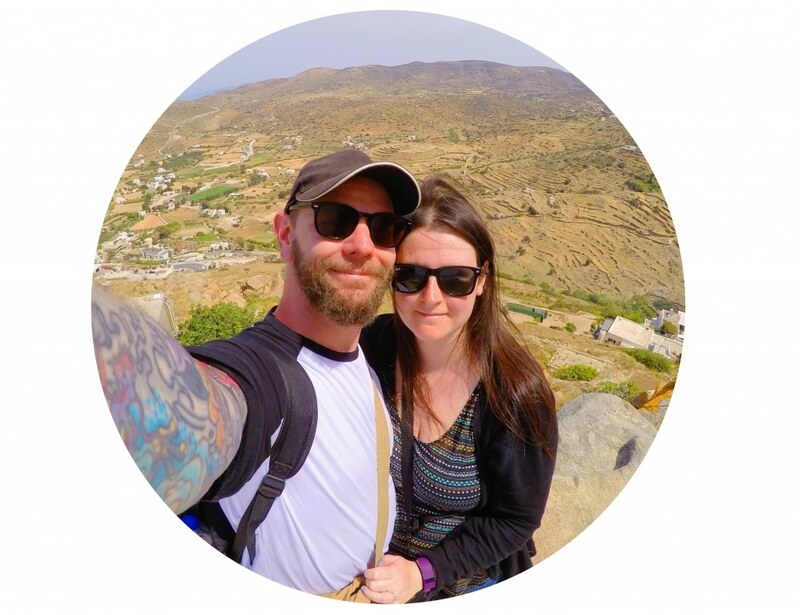 Enjoy as an accompaniment to your barbecue, as part of a salad or as an essential part of an antipasti plate – there is so much that you can do with them, so start getting creative. Obviously I had to eat this without the goats cheese, but I think goats cheese will be the first thing that I eat once baby arrives. You could add a tomato sauce to this, but we tried to keep it as simple as possible (I was stressing last night worrying about how the EU vote would go), and just mixed through some lemon juice and butter. It made it really light and fresh, as my lemon obsession continues through pregnancy and I am really trying my best to stay away from the lemon cake. 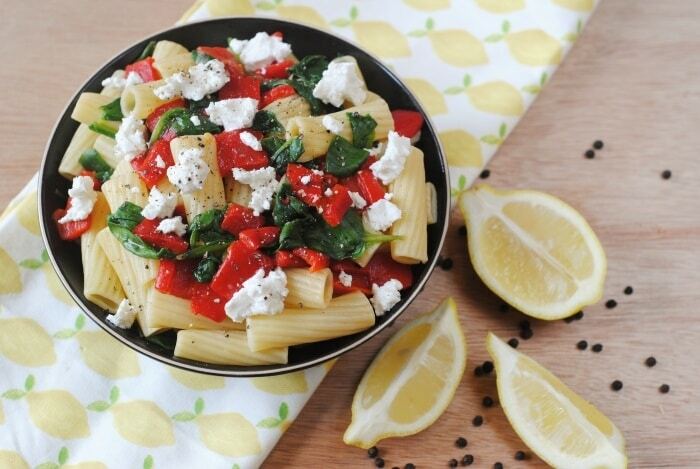 This Roasted Red Pepper, Spinach and Goats Cheese Pasta dish is quick and simple so all the ingredients can shine through. Put the pasta in a pan of boiling water and simmer for 12 minutes. Once the pasta is cooked, drain and put back in the pan with the butter and lemon juice and stir. Add the spinach and stir until it stats to wilt. Add the rest of the ingredients and serve. love how simple this recipe is. Looks so delicious ! 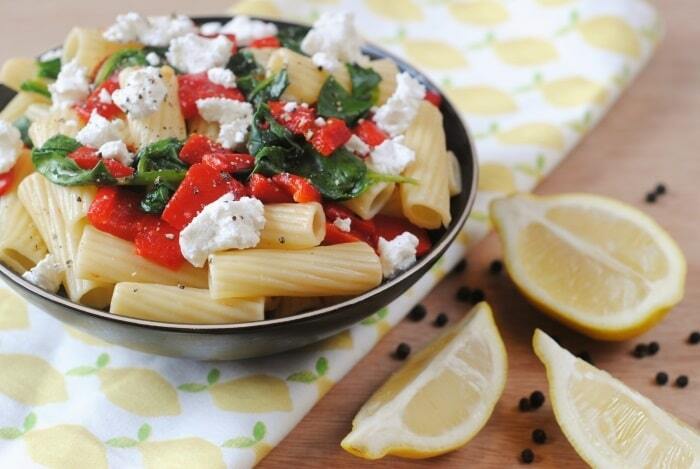 goat cheese, spinach, and red peppers are all favorites on pasta so this is perfect! Simple meals like these are usually the best thing right – I am asking OH to get some pepperdews today.